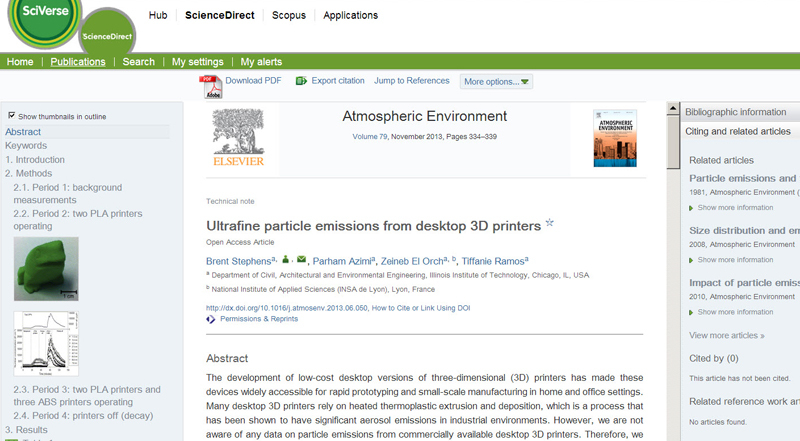 Could particle emissions from desktop 3D printers reach unhealthy levels? [caption id="attachment_26150" align="alignleft" width="105"] Brent Stephens, PhD[/caption]Dr. Brent Stephens is an assistant professor in the Department of Civil, Architectural and Environmental Engineering at Illinois Institute of Technology (IIT). He has a PhD in Civil Engineering and an MSE in Environmental and Water Resources Engineering, both from the University of Texas at Austin. He also has a BSE in Civil Engineering from Tennessee Technological University. Dr. Stephens and members of his Built Environment Research Group at IIT conduct energy and air quality research within the built environment, primarily with field measurements in and around buildings. Their work continues to advance building science methods for assessing energy efficiency, indoor air quality, and environmental exposures within buildings. 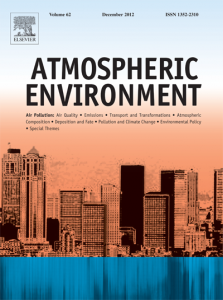 Atmospheric Environment publishes papers on the consequences of natural and human-induced changes to the earth’s atmospheres, including processes involving chemistry and physics of the atmosphere as well as subjects related to human health, welfare, climate change and environmental policy. Like this report, many of its articles look at how human activity can influence the atmosphere and human health. The development of low-cost desktop versions of three-dimensional (3D) printers has made these devices widely accessible for rapid prototyping and small-scale manufacturing in home and office settings. Many desktop 3D printers rely on heated thermoplastic extrusion and deposition — a process that has been shown to have significant aerosol emissions in other studies in industrial environments.In this work, we measured size-resolved and total ultrafine particle (UFP) concentrations resulting from the operation of a common type of these commercially available desktop 3D printers inside a commercial office space in Chicago. The printers were used to print small colorful frogs. (We each got to take home a frog of our own!) The resulting measured particle concentrations during each operation period are shown below:[caption id="attachment_26145" align="alignnone" width="800"] Ultrafine particle concentrations measured during operation of 3D printers in a small office space[/caption][caption id="attachment_26148" align="alignright" width="400"] Estimates of total UFP emission rates from individual 3D printers using either PLA or ABS feedstock[/caption]From the data, we also estimated size-resolved (11.5 nm to 116 nm) and total UFP (< 100 nm) emission rates and compared them to emission rates from other desktop devices and indoor activities known to emit fine and ultrafine particles. 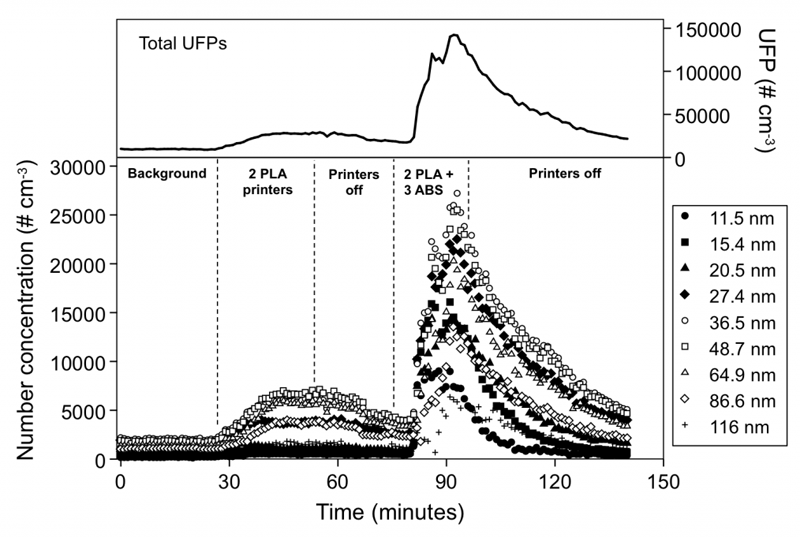 Estimates of emission rates of total UFPs were large, ranging from ~2.0×1010 #/minute for a 3D printer utilizing a lower temperature polylactic acid (PLA) feedstock to ~1.9×1011 #/min for the same type of 3D printer utilizing a higher temperature acrylonitrile butadiene styrene (ABS) thermoplastic feedstock. (You can read about some differences in these two feedstocks here and here). Human exposure to UFPs appears to be pretty important from a health perspective. These small particles deposit efficiently in both the pulmonary and alveolar regions of the lung, as well as in head airways. Deposition in head airways can also lead to translocation to the brain via the olfactory nerve. The high surface areas associated with UFPs also lead to high concentrations of other adsorbed or condensed compounds. Several recent epidemiological studies have also shown that elevated UFP number concentrations are associated with adverse health effects, including total and cardio-respiratory mortality, hospital admissions for stroke, and asthma symptoms. However, we don’t know much about the composition of these particles. 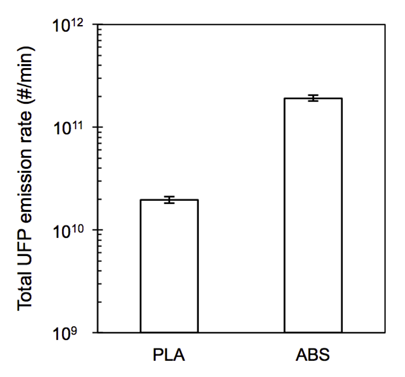 We have some evidence that PLA-fed 3D printers may be less harmful than ABS-fed printers not only because of differences in emission rates, but also because PLA is actually biocompatible and used in a lot of medical procedures. We also are aware of a few older studies showing toxicity of ABS fumes (both gases and particles) to rats and mice. But how these interact in our respiratory systems and any associated adverse health effects are still largely unknown. We are very grateful to Built Environment Research Group members Tiffanie Ramos, Parham Azimi, and Zeineb El Orch for their help in making the measurements and writing the paper. We are also grateful for former IIT CAEE graduate student Bobby Zylstra of The 3D Printer Experience and for Julie Friedman Steele of The Metaspace for providing access to the test space.